Ginger belongs to the plant family Zingiber officinale. Some say it is a plant root, others say it is an herb; still others say it is a spice. Whatever it is, it is an excellent medicine that has been in use for thousands of years. The history of its use goes as back as 2000 years. Its use as medicine was common even in ancient times in countries like China and India. Ginger is known for its strong taste and aroma. It gives excellent taste to curries, salads, soups and daily meals. In several countries, mostly Asian countries, ginger is an essential component of daily meals. There are several other ways ginger can be used. One such way is making ginger tea. To make this tea, take a 2 inch piece of ginger and chop it into small pieces. Boil them in a cup of water for 10-15 minutes and strain the water afterwards. You can also add a teaspoon of honey in this fluid to make it taste better. You can use this herbal tea as an alternative to tea and coffee. But what makes ginger so important? 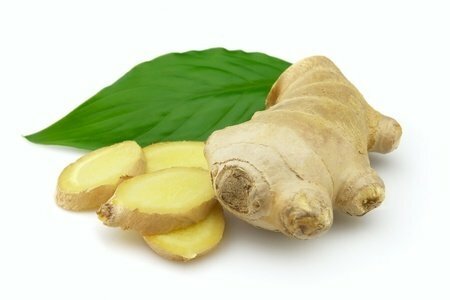 What are the benefits of the use of ginger? Below we’ve listed the health benefits and medicinal uses of ginger. Cure of respiratory problems. Most of the respiratory tract infections including flu, cough and allergies are due to the excessive release of a chemical known as “histamine” by certain cells (mast cells) present in the airway. Histamine causes contraction of air passage, irritation and difficulty in respiration. Ginger has anti-histamine property i.e. it can suppress the release and action of histamine. Ginger tea with honey, the recipe described, above is an excellent remedy for allergies, flu, cough and common flu. Relief from nausea and vomiting. Some studies have shown that chewing ginger or eating ginger powder can provide relief from motion sickness and nausea. Moreover, use of ginger is a proven cure for pregnancy induced nausea and vomiting. A study was conducted on 30 pregnant females. Out of the 30, some females were given 1 g of ginger everyday for 4 days. Other half of the pregnant females received a placebo. After 4 days, results showed that group of females using ginger showed significant decrease in nauseas and vomiting. A friend of gut. Use of ginger is very beneficial for several gut complications like heartburn. This action of ginger is due to its ability to speed up the digestion of food and passage of food through gut. Heartburn develops when food has to stay inside the stomach for a long duration. If the food leaves stomach early, no pressure will build inside the stomach and result would be heartburn free life. It also stimulates theproduction of mucus by stomach- another protection from excessive acid produced during heartburn. Since ginger speeds up the digestion and movement of food through the gut. That’s why it is a cure for constipation too. Makes headache go away. Drinking herbal ginger tea is an effective way to cure common headaches and migraine headache. This property of ginger is because of its ability to suppress prostaglandin synthesis- prostaglandins are chemical mediators causing sensation of pain. Reduces pain of arthritis. Arthritis is a degenerative disease, which is accompanied with joint swelling and pain. This pain is due to the excessive secretion of chemical mediators of inflammation. Ginger, as explained earlier, can suppress the production of these mediators and can thus decrease joint pain associated with arthritis. Might cure cancer. Ginger has got an excellent anti-oxidant property. Moreover, recent studies have shown that ginger might possess excellent anti-cancer properties as well. Cancer develops due to the abnormal growth and division of cells. Recent studies have shown that ginger extracts can induce rapid apoptosis (death) of rapidly dividing cells. However, this fact needs further investigation. Helps in weight loss. Herbal ginger teas are usually an integral component of weight loss programs. This property of ginger can apparently be attributed to two basic reasons. First, ginger boosts the metabolism. Higher metabolism means greater burning of fats. Secondly, ginger makes you feel full. When you feel full, you naturally eat less. Good for diabetes. Researches conducted in Australia have shown that use of ginger provides an effective control over blood glucose. This property of ginger is particularly helpful for diabetic patients that need to keep their blood glucose under proper check. So, the best way to have a controlled glycemic index (glucose level) is make more use of ginger in meals, salads, soups and curries and drink ginger tea. Provides relief from pain. One of the most important causes of pain is increase in the production of prostaglandins, as explained earlier. Ginger can suppress the production of these mediators. That’s why not only it cures arthritis pain, but can be used to cure a number of pains like muscle and joint pains. Anti-flatulence. Flatulence develops when food has to stay in the gut for a long period of time. When this happens, the gut bacteria get an opportunity to breakdown (ferment) the components of food into gas. The result is flatulence and abdominal pain. As explained earlier, stomach can help in the digestion of food and speeding up its passage through intestine. This way it functions to prevent flatulence. Improves absorption of food components. Having said earlier, ginger improves digestion of food. Proper digestion means proper uptake of food ingredients as well. So, drinking a cup of ginger tea each day is going to make sure that all the food you eat reaches its proper destination. Control blood pressure. This property of ginger can be attributed to its anti-oxidant properties. Because of its anti-oxidant property, it can help in the breakdown of unhealthy fats and cholesterol- the basic culprit for high blood pressure and heart disease. Improves skin health. Ginger helps remove the old and dying cells. Moreover, its natural anti-oxidant properties help give skin a better tone and natural glow.